WELCOME to Adventure As A Family! Doing things together (adventuring) is amazing for you and your family. The connections a family makes when they actually spend time together while learning and exploring the great outdoors reap benefits too numerous to count. Communication, confidence, laughs, smiles, stronger relationships, "remember when" stories, fitness....all of this happens when you get out and begin adventuring together. It is our hope that this site provides you with resources, tips, and advice for creating your next family adventure. If you are new to any of these activites, you have come to the right place to learn where to get started. If you are an expert, then share your expertise! Tell us what worked for your family! So what's stopping you? Get out and GO! Start your family adventure TODAY! What can be a family adventure? ANYTHING! Anything that involves the outdoors and family playing, planning, preparing and talking together can be turned into a family adventure. This site is going to focus on our favorites (at first anyway): car camping, kayaking, bicycling, hiking...someday backpacking, canoeing, canoe-camping, gardening, and more! 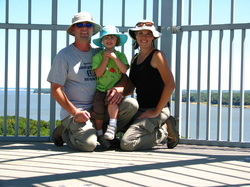 We are the Chapman's: Chad, Raejean and Kenna, and we enjoy "adventuring" together as a family! We are NOT experts (at least we don't think we are). However, we have had numerous requests for us to share our information, families that have joined us on our adventures to "learn" how we do it, and groups asking us to speak. All of this gave us the reason for starting this site...to share this knowledge with you. Come along on the journey and discover just how easy it is to build lasting family bonds and memories. Laugh and learn from our mistakes and get inspired to get out and go!